Governor of California Pete Wilson told a capacity crowd at the ARCO Forum last night that unless the state legislature passes his education reforms, California students will continue to graduate with deficient educations. Wilson said public school teachers in California are not responsible enough for the quality of their students' educations. To change that, Wilson is advocating teacher competency tests and increased education funding to make primary school classes smaller. Wilson blamed the California Teacher's Association, the teachers' union, for blocking a proposal that would require all students to take a standardized test, a test that he says would make teachers more "accountable." "They also oppose things like merit pay because they are the stout, egalitarian defenders of mediocrity," Wilson said. Wilson also said the State Department of Education and graduate department of education at California's state universities are "strenuously resisting" these reforms. "They feel it is wrong to burden children with memorization of multiplication tables," Wilson said. "They feel spelling is not important and indulge children in 'creative spelling." Wilson said he wants the legislature to pass his Permanent Class Size Reduction Act. In addition to shrinking class sizes in grades one through three to a maximum of 20 students, the act would also require teachers to pass a competency exam and submit a portfolio for the lessons they plan to teach. "I hope to see [the act] on the November ballot," Wilson said. "[The act] will make permanent the funding for class size reductions, and will do something about the quality of teaching." In an interview with The Crimson after the speech, Wilson defended his initiatives against the claim that they would exacerbate the present teacher shortage in the state. "Good teachers are all for this reform," Wilson said. After the address, Wilson said children of illegal immigrants burden the overcrowded public school system. The state, he said, is "morally entitled" to be reimbursed for this by the federal government. According to Wilson, 400,000 children of illegal immigrants are in California classrooms, costing the system $2 billion. "Remember, that is state tax money," Wilson said. "President Clinton has recognized that entitlement but has done nothing to reimburse us. This is a federal failure." As for the Presidency in the year 2000, Wilson said he would love to have the GOP nomination. "It depends on whether I can secure the resources," Wilson said. "If can, I will run. If not, I will find some other way to contribute in public service to this great country." 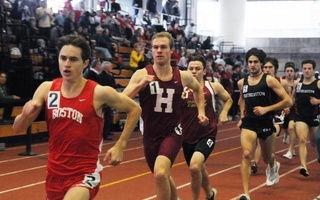 After the Harvard men’s and women’s track and field squads earned fourth-place finishes at last weekend’s Heptagonal Championships, the Crimson finished in the top 10 again this weekend at the Intercollegiate Association of Amateur Athletes of America Championship Meet and the Eastern College Athletic Conference Championship Meet.